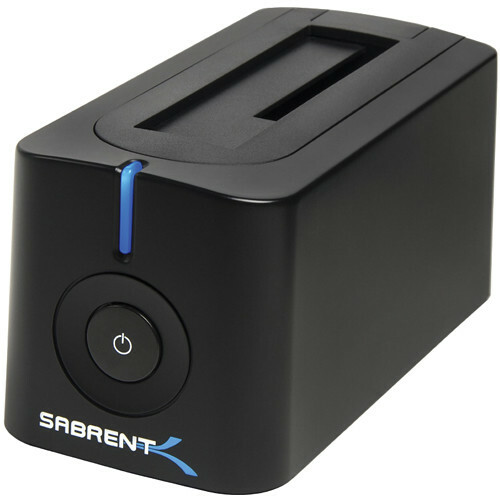 The USB 3.0 SATA 2.5"/3.5" Hard Drive Docking Station from Sabrent connects a 2.5" or 3.5" SATA hard drive to a computer through an available USB port. You can access a hard drive's contents by inserting the drive into the docking station and transferring data via USB 3.0 at speeds of up to 5 Gb/s. The docking station is also backward-compatible with USB 2.0 and 1.0. Number of Bays 1 x 2.5"/3.5"
Box Dimensions (LxWxH) 7.323 x 5.354 x 4.882"
USB 3.0 SATA 2.5"/3.5" Hard Drive Docking Station is rated 4.5 out of 5 by 31. Rated 4 out of 5 by B.P. from Super speedy but has one issue Works great. Has USB3 speeds and fits full sized HD's 3.5, as well as 2.5. The one draw back is, it won't work when you plug it's USB3 cord, into another usb3 extension cord. The exact reason is unknown, but I do have a theory. It's possible that since this is powered via wall outlet, it creates a grounding/feedback loop if you will, when connected to a usb3 extension cable. I can't be certain, but just keep this in mind. I found out because the included USB3 cable is only about 2 feet long, and it took 4 hours of web searching to figure this out. If you need a longer cord, you might as well buy it now. Rated 5 out of 5 by Barry from Sabrent USB 3.0 - Great Drive Dock! Previously we had NewerTech Voyager Q Drive docks connected to our older 2009 MacPro's in our student photo studios. These older MacPro's were connected to the Voyager Q docks via FW800 and worked fine. When the older Macs were replaced with 2013 MacPro's and we tried connecting the Voyager Q docks via the faster USB 3.0 connection, we encountered major problems tethering cameras, and simply copying files from the desk top. After much trouble shooting and failing to find the cause we replaced the NewerTech docks with the far less expensive Sabrent USB 3.0 drive docks and have been extremely happy with their performance. They are fast, reliable and so far trouble free. Rated 5 out of 5 by Ben from Love it Works as expected. Cheap way for me to backup or store projects that I don't need taking up space on my computer anymore. Would buy again. Only downside is that it's a little loud with a HDD running in it, due to it being in the open, but since I only use it when backing things up, it's not an issue. Rated 5 out of 5 by Lynn from Excellent product at a fair price I bought this dock to recover data from a failed iMac. It works exactly as advertised. Plug in the USB cable, drop in the hard drive, push the go button and your data is available. No muss, no fuss. Yes, I would recommend this to a friend. Rated 5 out of 5 by skier5834 from Perfect I bought this so that I could use an old Hard drive that I extracted from our old computer as a storage device. While there are a bunch of cables now with the A/C adapter cord and the USB 3.0 Cord, it works very well and the transfer rate is much better then the storage devices I was previously using. It is easy to set and it works beautifully. Couldn't complain about thing. Rated 5 out of 5 by n5oe from Works with Linux, and a timesaver. Using this for a weekly HDD backup I keep in the safe. Nice to just plug the drive into this docking station, mount it and rsync too (Linux Routine) Works perfectly, even backwards compat to USB2 which is all my little home server has. Rated 1 out of 5 by Victor B. from No access to a 8TB drive The Sabrent dock I purchased will not see a working partition on HFS-formatted 8TB Seagate drive. Apple System Profiler will only show a unpartitioned 8TB space.? The drive works perfectly in other docking enclosures. Is it USB 2.0 Compatable as well? Is its power supply universal? Yes. The power supply covers 100- 240 v input, which is essentially universal. Note that the power plug is for a US receptacle. I.e., to use it overseas you would only need an adapter to match the foreign receptacle, similar to what you use for your shaver or laptop with a universal supply. Will this work with an External Seagate FreeAgent GoFlex 500GB? No, this will not. It is for bear bones drives to connect them to the computer. The GoFlex already can connect through the USB port. will this support Seagate Archive HDD 8TB SATA III Hard Drive? No. The dock I purchased will not see a partition on HFS-formatted 8TB Seagate drive and Apple System Profiler is only showing a unpartitioned 8TB space. The mentioned drive works perfectly in other docking enclosures. Works with this cards? SanDisk 960GB Extreme Pro Solid State DriveTks. I own this docking station, and use it to transfer files to my archived hard drives. I believe the answer to this question would be yes, but I ask you, why? It connects to the computer on a fairly slow method, USB. You should install your SS drive as your boot drive for speed and efficiency, and use this for backup. If you want to copy a drive from your machine to the SS drive, I ASSUME it will work, but I have never done that. At aproximately $40, it is great, easy, but slower connection than an internal IDE cable. Can I use this on my iMac to recover my Windows hard drive? I have a Sony Vaio laptop that just died, but my desktop is a Mac. Yes. NTFS formatted drives will be read-only unless you buy a software package that replaces the drivers and enables full support.